TRENTON, N.J. (CNS) — While recuperating from life-threatening sepsis and the amputation of his lower left leg, Trenton Bishop David M. O’Connell gave a video interview about his progress. And no one would guess that that he just underwent major surgery. Wearing full clerical garb and smiling throughout the interview, a seated Bishop O’Connell was eager to let people know he is responding well to therapy, and to offer his thanks for the outpouring of support and prayer from people throughout the diocese. Rayanne Bennett, executive director of the Office of Communications and associate publisher of The Monitor, the diocesan newspaper, conducted the 10-minute question-and-answer interview, recorded by the diocesan Department of Radio and Television. The bishop underwent surgery Dec. 29 for amputation of his foot and leg midway between the knee and ankle. Several serious infections he had been fighting, arising from his ongoing battle with diabetes, necessitated the amputation. Though only a few weeks post operation, Bishop O’Connell said that “the healing is taking place very quickly, so that’s a very good sign.” He is confident that his therapy will assist a steady recovery. Doctors have even told him that once he is fitted with a prosthetic leg, no one will be able to know he ever had a problem with it. Bennett asked whether the bishop thought he would be recovered in time for Holy Week, which this year is March 29 to April 4. The bishop credits the medical personnel treating him for providing not only the medical intervention, but also the moral support needed for his healing. Daily Masses and rosaries for healing are being said in parishes and schools throughout the diocese, and Bishop O’Connell has a spiritual buoyancy that contributes to his outlook on everything that has transpired since he first entered the hospital. After undergoing emergency surgery, “I said to the Lord, ‘I’m in your hands, and I’m ready for you if the time is now, and I’ll come willingly and happily.’ I wouldn’t mind if he gave me some more time,” he chuckled. Well-wishers have showered him with “hundreds and hundreds and hundreds of cards and notes and letters and emails and phone calls.” Several parishes even sent blankets and prayer shawls to the bishop from their ministries. Despite being in recovery, the bishop’s chancery duties have continued on schedule. He has been informed of anything needing his immediate attention, has been able to receive mail and signs necessary paperwork. The diocesan vicars have continued to fill in for him, too. Bishop O’Connell also has received an overwhelming amount of correspondence and prayer from his diocesan priests, which is “something that touches me deeply,” he told Bennett. Perhaps the most difficult trial during his convalescence, said the bishop, is knowing he will have to miss out on so many diocesan engagements planned for the spring — saying Mass at different parishes and celebrating Confirmations. 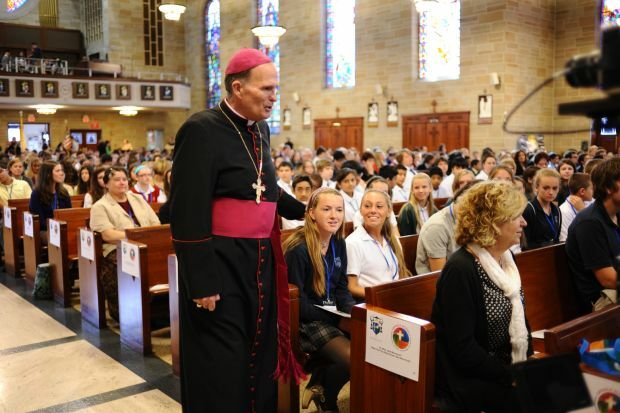 The “greatest joy” of being a bishop, he said, is to be with the people.